Beat This Caption Contest 49 Winner – Caption Contest Funny Clever Witty Enter Today! Are you sure their grill can handle this? 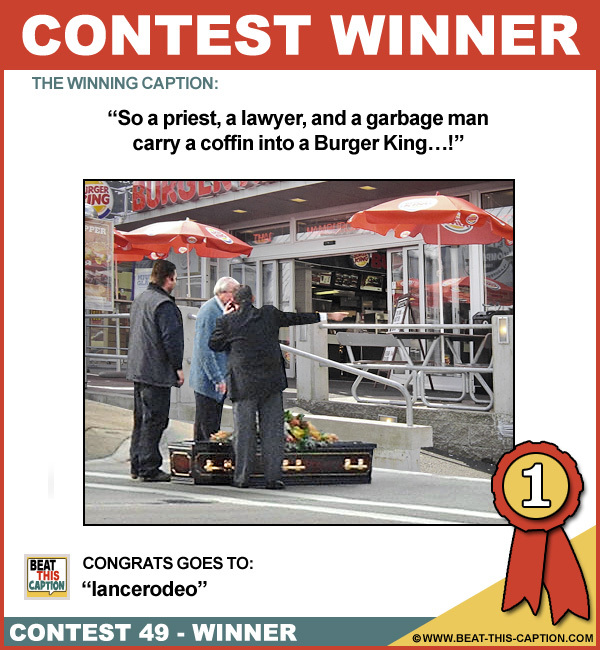 So a priest, a lawyer, and a garbage man carry a coffin into a Burger King…! Fill it up with chicken nuggets. May he rest in pieces! He died trying to work out the last two “Guess the Caption”s! He always wanted to be a king so we are going to bury him with one of the paper crowns they give out! Rare photograph turns up of Elvis Presley’s funeral! Jeffrey Dahmer’s version of the Whopper! Nothing but the best for my mother-in-law! UPS left him at the curb, knocked and quickly sped off!